Haitians still have a pressing need for food and shelter as they recover from the massive earthquake that struck in January. As a member of the Maine sailing community, I'm organizing a drive to collect used sails to be shipped to Haiti to be used as makeshift shelter. The rainy season is starting early this year in the Caribbean, so the faster we can get our used sails to Haiti, the better off the estimated 770,000 homeless will be. Maine Sailing Partners in Freeport is willing to be a drop-off point for your sails, March 5 until March 19, M-F 8:00 to 5:00. Pope Sails and Rigging, in Rockland will accept sails in the mid-coast area, March 5 until March 19, M-F 8:00 to 5:00. Sea Bags, Custom House Wharf, on the Portland Waterfront, will accept sails and give you a bag in return, thru March 21 also. Portland Yacht Service will accept sails in Building 11 during the hours of the Maine Boatbuilders Show, March 19, 20 and 21. They will then be trucked to Miami where two organizations, Haiti-Life and Shake-a-Leg, have the infrastructure in place to ship the sails to Haiti. Please contact your friends, fellow yacht club members, other sailors, anyone you know who might have old, used sails taking up space and ask them to donate to the people of Haiti. Deadline for donations will be Friday, March 19. Shake A Leg the Miami collection point, and Haiti-Life, the shipper to and distributor in Haiti are both 501c3 organizations so your donation is tax deductible. Shipping from Miami to Haiti is funded by Project Medishare, also a 501c3. Please have the hoist and foot lengths available so we can properly tag the sail. I've been actively sailing the Coast of Maine for over 30 years in a classic wooden boat; have made two trips to the Caribbean on her; helped Bruce Schwab prepare Ocean Planet for the start of the Vendee Globe Race, including the transatlantic delivery; race yearly in the Wooden Boat races; done four Marblehead-Halifax races. An up-date. The Sails for Haiti has far exceeded my expectations. We've gathered over 300 sails as of this morning, from Opti (tiny) to Maxi (huge). R. C.Moore will be shipping the sails to Miami and will be loaning me a loading dock for a few days. Hannaford is donating a pile of pallets. Moore is giving me a rock bottom figure but we will fill an entire 53' trailer so the shipping cost will be higher that I budgeted. I'm sending out the following plea state-wide to help offset the additional costs. If Maine Friends of Haiti or it's members feel so inclined, a donation would be greatly appreciated. Please pass this on to your members. The Sails for Haiti project is coming to the end. Just a few more days to donate your used sails to be shipped to Haiti to be used as shelter for the over 770,000 left homeless by the recent earthquake. We will be shipping close to 300 used sails of all sizes, Opti to Maxi, to Miami by truck next week. The Maine Sailing Community has rallied together, and so we have far more sails than we ever hoped for. We need to raise $3500 to pay for shipping to Miami. You may make a tax deductible donation for shipping the Sails for Haiti through Shake-A-Leg in Miami, a non-profit, tax exempt 501c3 organization. Make your donation by clicking here and enter Maine Sails for Haiti in the Job Title or Gift Note box. Thanks for your generosity, and for making a difference! I apologize for sending out a mass mailing but there are way too many people to thank for contributing to the Sails for Haiti project. I appreciate you contacting your members or clients with my request for used sails. Below is a 'thank you' note that you may send off to them, if you so desire. The project not only collected more sails than I ever expected, but it also spawned at least three other sail drives around the country. We did it. Nearly 400 sails, 14,000+ pounds, on 60 pallets, a full 53' trailer, arrived in Miami the morning of March 29. Half the sails are now in Haiti where they'll be trucked to the outskirts of Port au Prince to used for temporary shelter. The other half will follow on the next ship. I'd like to thank the collection points: Rob and Win at Maine Sailing Partners; Doug at Pope Sails and Rigging; Glenn at Mount Desert Island Community Sailing Center; Kevin at PSA; Amy, Beth and the enthusiastic crew at Sea Bags in Portland. Phin Sprague at PYS and the MBB show, Jane Wellahan at Maine Built Boats and Bruce Schwab thru his web site all worked to get the word out not only in Maine but around the country. Thanks. In addition, I'd like to thank all the yacht clubs, boat yards, builders, and brokers who contacted their customers. Wayne at Hamilton Marine donated two pallet boxes filled with rope as well as transportation for some of the sails. 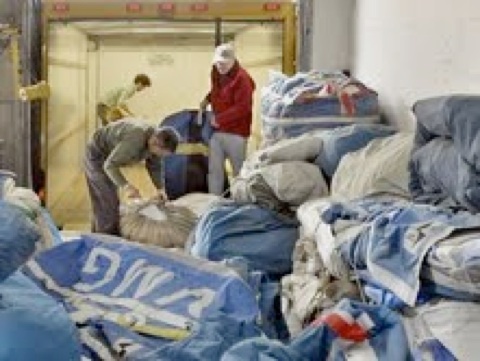 Massachusetts Maritime Academy donated 50 sails, most from the first Blue Yankee, and Sea Bags dipped into their stock to donate well over 100 sails. Hannaford Bros. helped with logistics as well as pallets and pallet boxes. Shawn Moore at R.C. Moore trucking supplied warehouse space, more logistical advice, as well as the trailer, tractor and driver to get the sails to Miami. Shake-A-Leg took care of the logistics in Miami, Project Medishare the shipping to Haiti. Haiti-Life is distributing the sails in Haiti. Their people have worked non-stop on the ground in Haiti since the earthquake hit. But it would not have worked without the generosity of you the sailors in Maine and others from northern New England. The people of Haiti know your sails are coming and already send thanks. All I have is the attached photo but they might also be interested in the following article about the fellow who founded Project Medishare and is involved with Haiti-Life and Shake-A-Leg. What's missing in the online version are pics of the working conditions in the Project Medishare hospital in Haiti and a very moving interview with Alonzo Mourning who raised about $1,000,000 for the tents Project Medishare now has just outside Port au Prince.